Whether you are a first time buyer or a seasoned hunter. If you are looking for a safe to keep your firearms protected and out of the hands of others, the Stack On FS-24-MG-C, 24 Gun Safe will keep your guns secure. Stack-On is known for its top quality and this safe is no different. It’s affordable cost and well built design will be a great investment for years to come. For the FS-24-MG-C Gun Safe, you can choose a three-number combination dial or an electronic keypad with backup keys. This will depend on whether or not you are a old school kind of guy, or somebody who likes the easiness of digital. Both are well built and will suit whatever needs you want fulfilled. Fellow owners of the Stack-On 24 say they can comfortably fit between eight and ten rifles, with scopes attached, on one side. We at TossTheKey were able to do this as well. Without scopes and attachments you can fit plenty more firearms in your safe. If you don’t have that many firearms the safe is also convenient for storing important documents and valuables, although it is not recommended for storing electronics. The FS-24-MG-C Gun Safe comes with with additional clips which some owners have used to make homemade shelves. The unit is fully carpeted and, of course, fire resistant. Tested to withstand a temperature of 1400 degrees, your valuables will be protected should a fire ignite. Weighing in at around 456 pounds (empty) the safe will require some planned moving on your part but will not be going anywhere easily should there be a home invasion. The safe comes with pre-drilled holes that pass the fire resistant testing and allow you to mount your safe firmly in location for additional peace of mind. Should you fall victim to a fire or break-in the safe has a limited lifetime warranty. While the FS-24-MG-C Gun Safe is a solid unit, some owners have found the exterior casing to be thin. This results in denting of the metal. This is merely cosmetic and does not affect the ability of the unit to keep your items protected. There are a few differences of opinions when it comes to the fluidity of the combination dial. Most users experience smooth and consistent movement. While a few have come across some snags. While the door has three live bolts and two deadbolts, some users have experienced movement in the door after closing and locking. While this is not enough room to compromise the integrity of the safe, it does result in a slight rattle. With the interior being fully carpeted; some have found it is not always attached. This is also a cosmetic issue and does not compromise security. All of the above setbacks experienced by other Amazon customers were not dealt to us here at TossTheKey. While there are a few differences of opinions they are simply regarding cosmetics. The Stack-On FS-24-MG-C, 24 Gun Safe is an excellent purchase. It keeps your firearms out of reach and your valuables in a safe, secure place. With the added benefits of being fire resistant and a limited lifetime warranty, you can’t go wrong. 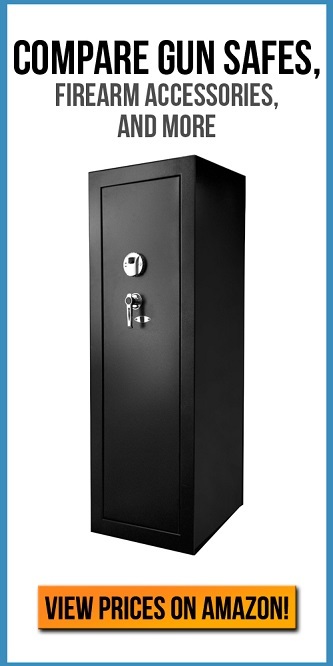 It is comparable in price and for a medium-sized safe. Has room to hold several different firearms along with attachments, ammunition, and your valuables. You have the freedom to personalize your unit and a peace of mind knowing you have invested in state of the art security.